First line: "The pigeons had taken over St. Mark's Square." 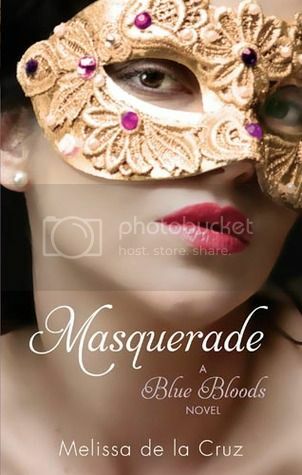 Masquerade is the second volume in the Blue Bloods series. This one veers a bit (only a bit, mind you) from the formula of the first. There's slightly less brand-name dropping and conspicuous consumption in this one, and a little more international intrigue in Italy as teen vampires-in-training hobnob with the wealthy New York elite. Schuyler is searching for her missing grandfather, a patriarch amongst the ancient vampires, but in the meantime she requires a human blood donor. She leans on her best friend Oliver, who (of course) is secretly in love with her. Mimi Force, daughter of the powerful New York businessman Charles Force, is busy planning the party of the century. Mimi is eagerly looking forward to "bonding" with her twin brother Jack... and he is secretly feeling really not so sure about the whole thing. There's plenty of confusion about who's related to who - all the vampires are essentially reincarnated avatars of saints, angels or gods and inter-related in various ways. Jack and Schuyler are being established as a couple to root for, yet they are technically first cousins. Mimi and Jack have been a couple for many lifetimes, and no one is more frustrated than Mimi about the inappropriateness of wanting to marry her twin brother. There is a side plot about Bliss Llewellyn being duped by Kingsley, an undercover agent, but she still pines for missing Dylan. Who are the real villains? Who are the Silver Bloods? The cliffhanger ending leaves everything still up in the air.